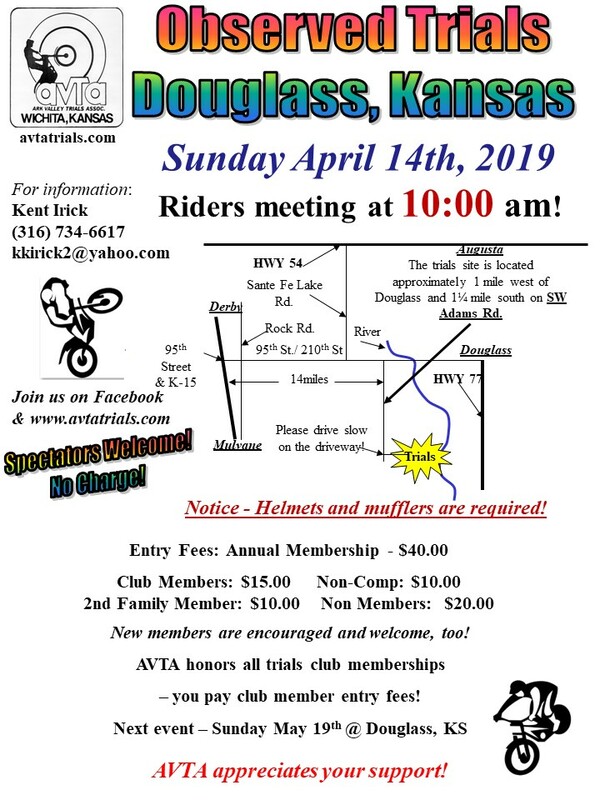 Next club event is set for April 14th at Douglass, KS. Click here for the event flyer! Our May event is the third weekend in May to avoid conflict with Mother's Day. Plan for Sunday May 19th at Douglass, KS. The 2019 AVTA MotoTrials calendar of events is nearly complete. We will post a digital version here and on the club's Facebook page once available. NATC, CRTC, and all AVTA club events will be noted. If the Ute Cup has been decided by the publication date, we will include it and any other notable Trials event, too. Next club meeting is set for Wednesday April 17th. We will meet at 7:30 pm at Mack Burnett's garage with the 6 pm pre-meeting at Merle's Place, just North of 2nd Street on Seneca. If you would like to join AVTA as a full member, please plan on attending any club meeting. Annual dues are $40. Guests are always welcome! Annual club officer elections will be held at the June 12th club meeting. Positions are President, Vice President, Secretary, & Treasurer. Contact Kent Irick to nominate a club member or express your interest in serving the Ark Valley Trials Association as a club officer. The Flint Hills 2-day was one of the toughest yet but yielded many smiles from the field of competitors. Check out the great photos from Lisa Robertson and others posted on our Facebook page! Events like this take tremendous amounts of time and effort. Our heartfelt thanks to club members Randy Black, Marvin Edgington, David Black, Mike Peterson, & Ross Reed for their mowing skills and section setting efforts in planning the event. Thanks to all the AVTA club members that contributed time and effort to make the trial grounds at Sedan ready for a true trials test of skill and ability at all levels. At the June 13th club meeting elections were held. Our 2018 officers are Kent Irick - President, Jason Rexroat - Vice President, Greg Gann - Secretary, and Rick Rexroat - Treasurer. We thank each of these club members for stepping up and taking leadership roles within AVTA. If you would like to serve as an club officer for 2019, please reach out to Kent Irick. 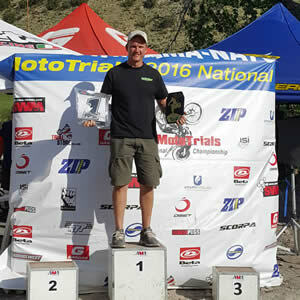 It's official - Round 3 of the 2017 AMA/NATC National Championship has received the distinction of "Best Event" as voted on by the riders that participated. Close runner up was Ohio, who also held a great event. Congratulations to our volunteers, club members, family members, and riders for earning a repeat distinction for our national event at Sedan, KS! Our 2014 National also earned this prestigeous distinction. We had amazing weather and a great turnout for this year's Flint Hills 2-day at Sedan, KS. Special thanks to our land owners, Ron & Leah! We appreciate their support of the trials community! A compilation of the 2018 US trial dates can be downloaded by clicking here! The NATC series, Ute Cup, and CRTC known dates are included. Please check back for updated information as event dates grow closer. Thanks! 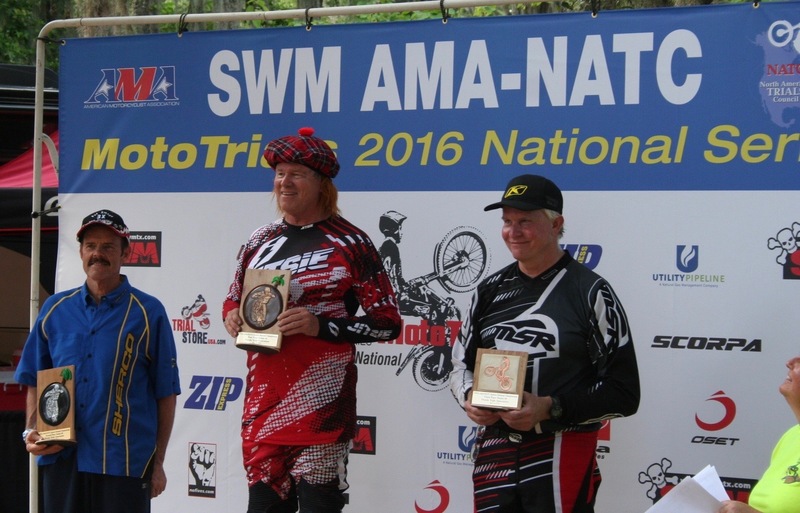 The AMA NATC Western Series Kansas Oz National was big success! Thanks to everyone that volunteered and helped prep the grounds for this major trials event. It means a lot to us! There are tons of great pictures on our AVTA Facebook page. It is a closed group so ask to be added as a member, please. No sales pitches allowed! ADVrider has good photos, too in the Trials section of the Forums. Here's the MotoTrials.com recap of the Kansas National - click here! Here's Shan Moore's recap of the Kansas National - click here! Photos taken by Russ Amos, MATT - click here! Here's a recap of the 2014 Oz National at Sedan, KS! Think Kansas is flat? Just do a search on You Tube for "Kansas National" and enjoy! 2017-2018 AVTA club officers are Kent Irick, president; Payden Campbell, vice president; Greg Gann, secretary; Rick Rexroat, treasurer. Reminder, club dues are payable in May, due in June. Club elections are always held at the June AVTA club meeting. Please take time to review our club rules which are aligned with the NATC scoring rules. We do not follow all of the rules beyond scoring. You can find the current 2017 AVTA rules by clicking the menu link on the left labled "About Us" - included at the bottom of the About Us page is the link to the Kansas State Championship scoring. Mid America Powersports now carries Gas Gas Trials and Enduro motorcycles! Thanks Ross! The 2016 NATC National Series started back in May at Ocala, Florida, then Sequatchie, Tennessee, Portland, Oregon and finally wrapped up at Canon City, Colorado's Stock Ranch. 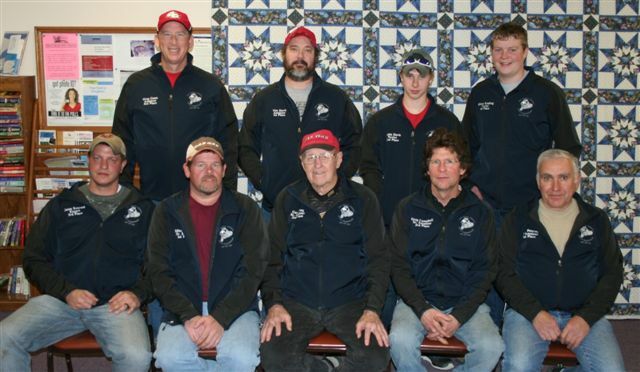 Payden Campbell, Greg Campbell, Marvin Edgington (SR60 National Champion), Dustin Land (Expert Sportsman Champion), Reid Malcom, and Tim Razy competed in this year's series. We couldn't be more proud of their efforts and sportsmanship! Congratulations to Payden, Greg, Marvin, Reid, Tim, & Dustin! While you're checking out Dustin's recap on the Lewisport USA website, scroll down further and follow Adrian's account of his recent Scottish 6-Days ride! Well done, Mate! Thanks to Cheryl Campbell for taking great pictures. You can find them posted on our Facebook page. 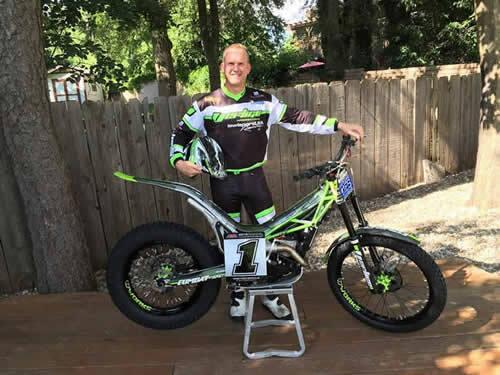 For the AVTA team- Congratulations to Dustin Land (2016 Expert Sportsman Champion) on dominating the Western Series….Impressive and fun to watch. Marvin Egington (SR60) looked great in a very competitive class. Incredible that only a few points separated the entire field. Congrats to the Campbell’s (Payton and Greg) for many great rides and a very competitive showing!! Also congrats to Tim Razy (SCM) for his first national. He found his “groove” and looked great. Thanks to everyone that rode the July trial at Douglass, KS! It was hot again, but challenging. Our appreciation and thanks to the Wednesday group that works hard to make each trial challenging, safe, and fun! Thank you guys! MidAmerica Powersports now carries the entire Jitsie line! They are also our local Montesa Honda dealer. Thanks Ross! Rookies Liam Tribelhorn & Drake Tribelhorn had a pair of 1st place wins apiece, with Drake edging out brother Liam for the 1st overall win. Julian Bucher was 3rd overall in Rookie. Rachel Campbell took 2nd both days and was 1st overall in Novice. Tiffany Bucher won both days for 1st overall in the Amateur class. Following Tiffany, Tammy Cook 2nd overall and Jenni Nelson 3rd overall. Gary Wing (age 80) had a pair of wins in Senior Amateur for 1st overall. Rick Rexroat took 2nd overall. Reid Malcom won both days and secured the overall win in the Intermediate class which was by far the largest class with 17 entries. In Senior Expert, Steve Messenger placed 1st both days giving Steve the 1st overall trophy. Mitch Wing was 3rd overall. Wes Bucher took 2nd overall in the Expert class & Jason Rexroat was 3rd overall. Sooner Cup 2016 Champion was Ryan Young. Congratulations to all the riders! At our regular February club meeting it was noted that the Ark Valley Trials Association now has over 60 paid members! Congratulations! At the AVTA annual awards banquet we honored Gary Wing with honorary club membership as well as bestowing the first ever "Golden Punch" which grants Gary a pass on judging events. Gary recently turned 80 years old (he's been riding since JFK was in office) and was among the 34 riders that braved the 18 degree weather at Douglass, KS for our January event. Congratulations to Gary Wing! AVTA is fortunate to have great riding areas available as well as a true four seasons climate - it is Kansas, after all. We are a rain or shine event club with only one cancellation in 40+ years of organizing monthly trials events. That single event was called due to extreme icing conditions that made travel impossible. While we don't have a picture of the December trial's riders meeting held in pouring rain, we do have a few shots from our last snow trial held back in 2005. Enjoy! April 23-24th - TACO (Trials & Adventure Club of Oklahoma) *new location & host club* Buffalo Dream Ranch Mountain Park in Southwest Oklahoma near Cooperton. November 5-6th NTTA Muenster, TX. ***Date change!!! The 2016 CRTC event schedule allows for increased club participation and NO conflicts with NATC Nationals, Ute Cup, and Cornhuster Cup events. We will continue to follow the NATC rules for scoring and section marking in 2016 This means no more riding up a line - you must ride only your class splits. The series will count the best of 7 out of 10 rides so if you have a bad day, not to worry. For 2016, CRTC participants must compete in six of the ten rounds to be eligible for series end awards. Special thanks to our corporate sponsor Gas Gas USA, and Dale Malasek for the great support over the years. It is very much appreciated! Here's the latest from the 2015 NATC Meeting in Birmingham, AL...club members Kent Irick and Randy Black served as our official AVTA representatives. New Hall of Fame Inductees: Dale Malasek, Stan Hensley, Scott Head, Sid Mulden, & Jerry Huddleston. Congratulations! Rule Changes were focused upon grammatical changes. New requirement that all riders use a wrist tether type kill switch. The tether must be worn at all times or it is a guaranteed 5 once you enter the section without one in place. New Class: Air cooled Monoshocks can ride the Clubman line. ACM is the class moniker. Events: 2016 - West rounds are Oregon & Colorado, East rounds are Tennesee & Florida. 2017 - West rounds are Texas, Southern California, & Northern California. East rounds are Rhode Island & Ohio. World Round in Arizona set for July 2017. These dates are provisional at this time due to the final WTC dates. This year's Flint Hills 2-day was a good time for everyone, including the surprize rattlesnake in Section 2, Sunday afternoon. Gladly, he moved on and so did we. Great trials action both days and perfect weather, too. Thanks to everyone for your continued support of MotoTrials in Kansas! Our Facebook page has some great spectator taken footage of the afternoon riders - take a look! AVTA members pay $15 entry fee per trial. Non members pay $20 entry fee per trial. ***Out of state Trials Club (MATT, MWTA, NEOTT, TEXOMA, TNT, NTTA, RMTA, NMTA, etc.) members will pay the AVTA member entry fee of $15. Non Competition entry fee remains $10 as does 2nd family member costs, $10. Save some green and join the AVTA for the bargain cost of $40! ***These rates apply to regular club trials only. Special events such as the Flint Hills 2-day and the Nationals have their own exclusive pricing. As always, see the event flyer or call AVTA President Kent Irick for details. Thanks to outgoing President David Black and Vice President Wes Bucher for their leadership and dedication to AVTA and the grand sport of MotoTrials! Our next club trial is scheduled for Sunday December 13th - Douglass, KS. We will certify the 2016 AVTA trials calendar at our next club meeting to be held on Wednesday December 16th. Once certified, we will post online and mail out to active club members. Mark your calendars for Sunday January 10th - Douglass, KS ***Annual AVTA Awards Banquet immediately following the trial. Club members are asked to bring a side dish or desert for the banquet to be held at the Douglass, KS Senior Center. Would you like to join the Ark Valley Trials Association? Contact Kent Irick, AVTA Club President at the number listed near the bottom of our event flyer below for more information. Observed Trials is a great family sport that anyone can enjoy! 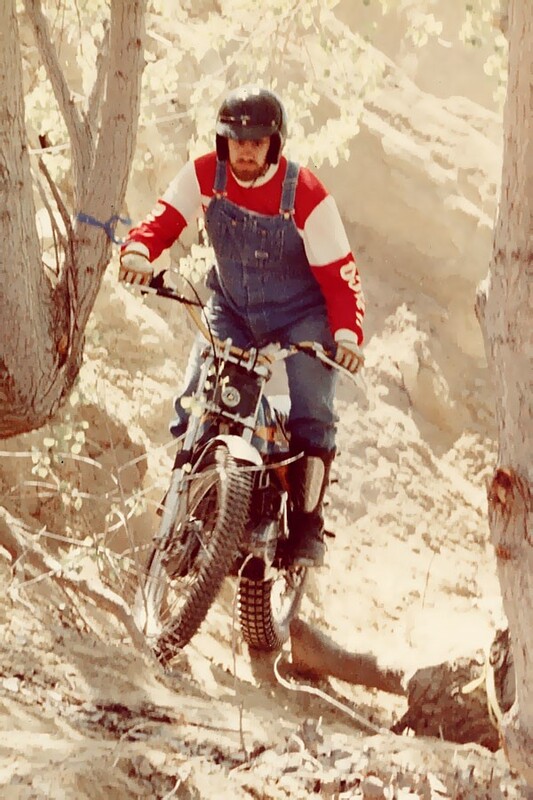 Who is this fashionable vintage trials rider from the AVTA archive? We'll post this on the AVTA Facebook page, too so you can make your guesses there. Watch for more episodes of "How the Loop was Won" as the statute of limitations expires on certain AVTA archival footage! There are a limited number of OZ National t-shirts available. We also have the red Flint Hills 2-Day shirts available, too. Contact Rick Rexroat by email (click on his name). The shirts are the slate grey version of what the checkers wore with the club logo on the front left and the OZ National design on the back (shirt shown is a prototype - your shirt will have this design on the back). 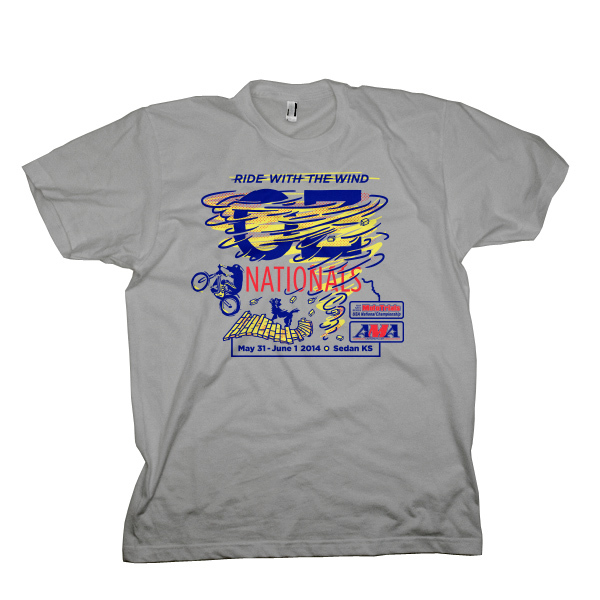 This limited run of OZ National shirts is bargain priced at just $15 a shirt. Don't hesitate - get yours today! Trials & Enduro News was in Sedan to capture all the great trials action. Read Shan Moore's report on the 2014 Kansas MotoTrials Oz National here! See Shan Moore's photo gallery here! See Shan Moore's video here! Words can't express how much the AVTA and I appreciate your support and service to the first "OZ" National. Now that the dust has settled we are seeing some very impressive numbers regarding the number of people that attended. Without your support and participation the event would not have happened. The attendees were given an excellent showing of what Trials is all about and more importantly how fabulous Trials people really are. that helped not included in this e-mail since several stepped up and I don't have their addresses. Trials people are the best..............and yes they do "ROCK" literally. 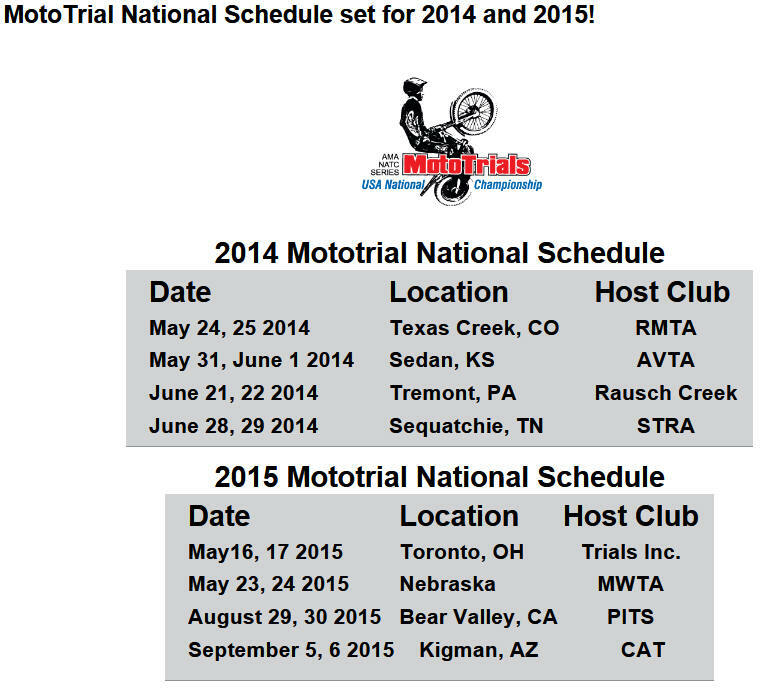 The Ark Valley Trials Association is an American Motorcyclist Association (AMA) chartered club! We're also affiliated with ITSA, the International Twin Shock Association! 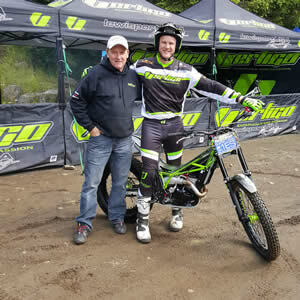 Check out the latest issue of Trials and Enduro News! Just click and enjoy! Have you checked our Facebook page lately? 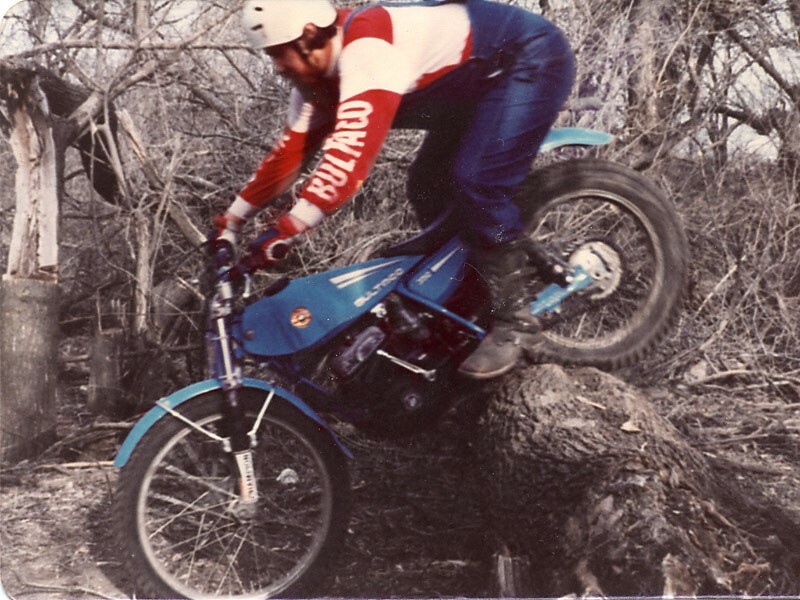 Past club member Matt Smith has shared from his vault of vintage trials pictures from a time when safety equipment was for someone else. Can you name the hooligans in each photo? Thanks Matt! Ok, you did ok with this group...now try the menu link on your left...AVTA's new feature "Blast from the Past!" Kansas native and Observed Trials legend Bill Grapevine was one of the most influential forefathers of US trials with an impact felt across the world. 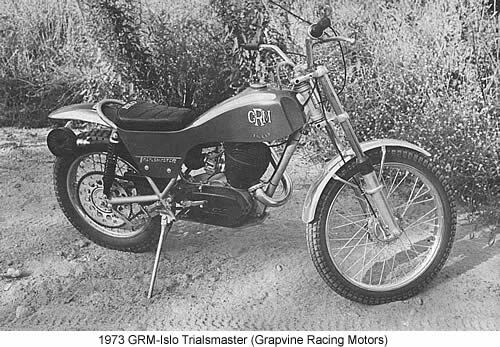 Trials Competition magazine ran a two part article on Bill's life and his fabled GRM trials motorcycle. Thanks to Trials Comp and Randy Black, we are able to represent parts one & two. In addition, we are including links to Bill's notation in the NATC Hall of Fame as well as a vintage copy of the GRM sales brochure. Enjoy! After January's regular club trial, AVTA held our annual awards banquet at the Douglass Senior Center. Special thanks to Brad Lane for smoking the BBQ meats and our talented group of club member wives who kept things orderly and hot, too. With 2013 wrapped up and in the books, it was time to present class awards for the Kansas State Trials Championship. We paid the top three winners in each class this year. Seated left to right: Kyle Manny, Steve Messenger, Mitch Wing, Greg Campbell, Preston Campbell. Standing left to right: Jason Rexroat, David Pettegrew, Tim Davis, Justin Davis, Gary Wing, Greg Gann, Wes Bucher, Josh Nutsch, Steve Nutsch. Congratulations! Our next club meeting will be Wednesday March 12th at Mac Burnett's Garage, 7:30 pm. Pre-meeting as usual at the Annex Lounge, Harry & Woodlawn at 6:00pm. Attendance at the Pre-meeting is strictly voluntary but always appreciated. The Annex cooks up a great burger at a great price, served with chips (no fries). The bar is smoke free, too. We chat about the trials world and who was faster when. Join us! AVTA is looking for a club member to take on the duty of awards master. This person would be responsible for ensuring the club has the appropriate number of trophies for each club trial. This requires a working relationship with a trophy company, securing an affordable price for awards, and maintaining our stock of on hand trophies. The Awards Master assists the Trials Master in the trophy presentation after each trial. If you are interested please contact David Black or any AVTA club officer. The club would also like to thank our club Vice President, David Pettegrew for his tireless work in providing the club great trophies at an affordable price all these years. Thanks David!!! It's that time of year again and a number of very well maintained, late model trials bikes are coming up for sale. Keep checking both our Facebook group and the Bikes for Sale link for the best deals! The Final 2013 CRTC results have been tabulated and are now official! Click the "Central Regional Trials Championship" link on the left menu to find out how everyone did! AVTA CRTC 2013 award winners of the new expanded 12 event, best 7 rides series (seated, left to right): Jason Rexroat, Mitch Wing, Gary Wing, Greg Campbell, & Mike Petersen. (Backrow) Greg Gann, Tim Davis, Justin Davis, & Ethan Keating. Not pictured: Dustin Land, Dalton Land, Cody Rexroat. Rounds 9 & 10 of the Central Regional Trials Championship are complete! The Flint Hills 2-day will be remembered as one of the best yet. Many thanks to club members Mike Petersen, Wes Bucher, Randy Black, Rick Rexroat, Dean Metsker, Mac Burnett, Steve Williams, Dale Reynolds, Ron & Leah Gracia, Peggy Black & Marvin Edgington who with the help of the rest of our fine club members made this year's 2-day a huge success! Special thanks to Charlie Wagner for the outstanding club trophies! It was great to see such a turn out from across the Midwest, too. Thanks! Thanks to all the club members that participated in the Sedgwick County Sheriff's Office Law Camp trials demonstration at Lake Afton Park! The kids loved seeing the bikes and trials riders demonstrating what a great family sport Observed Trials can be! Check our Facebook page for pictures of the event! 2010 GasGas 300 Race, Red color with CARBON FIBER airbox (uncommon). If you know the whereabouts of this bike please contact the local Police Department in your area & Marvin Edgington at 316-393-6672. Club Officers were elected at the June meeting as follows: President - David Black, Vice President - David Pettegrew, Treasurer - Rick Rexroat, and Secretary - Greg Gann. The Ark Valley Trials Association hosts information and results for the Central Regional Trials Championship proudly sponsored by GAS GAS - USA! With much anticipation, the 2014 Central Regional Trials Championship schedule is finalized. Congratulations and thanks to all the class winners and participants of the 2013 CRTC. Special thanks to Jason Carpenter and family for organizing the CRTC these past years, too. The series has a couple of changes for 2014. Nebraska is not participating for 2014. We hope they rejoin the series in 2015. If everyone agrees, we will follow the National rules this year. This means no more riding up a line - you must ride only your class splits. The series will count the best of 8 out of 10 rides so if you have a bad day, not to worry. Special thanks to our corporate sponsor Gas Gas USA, and Dale Malasek for the great support over the years. It is very much appreciated! ***Special thanks to Dale Malasek & Gas Gas USA for sponsoring the CRTC!!! The 2012 Central Regional Trials Championship results are in! Click here to find out more! This year's Flint Hills 2-day in Peru, KS was a great success! Here's a shot of the overall event winners (at least those still standing)...Randy Black - Twin Shock, Kyle Manny - Novice, Neil King - Intermediate, Mitch Wing - Senior Expert, Dustin Land - Master, and Rick Land - Expert. Rick finished the day on Sunday with a clean score card! Ian Griffin (Sr. AM, not pictured) rode Saturday and took a point on his last section of the last loop for a total score of one point. Ian heads off to Seattle after 18 years as an AVTA member. Our loss is their gain! Thanks to everyone who participated in this year's Flint Hills 2-Day! A big "Thank You!!!" to everyone who helped plan, work, and support this year's 2-day event. Everyone's attendance & participation is always greatly appreciated and helps to keep the family sport of Observed Trials alive and growing! Have some time in the middle of the week? Try riding with the Wednesday group! Just meet at the Triangle in downtown Douglass, Kansas for lunch. After a fine meal and some wrangling with the local waitresses, the Wednesday group heads to the quarry for an afternoon of trials fun. Ever wonder where that great section (or the one that gave you fits!) came from at one of our events? It likely found life from the Wednesday AVTA group. The more the merrier which now that we think about it, could actually be scary! It sure beats wasting time some where else! Thanks to all the great riders (past & present) that help keep the sport of Observed Trials alive and growing!